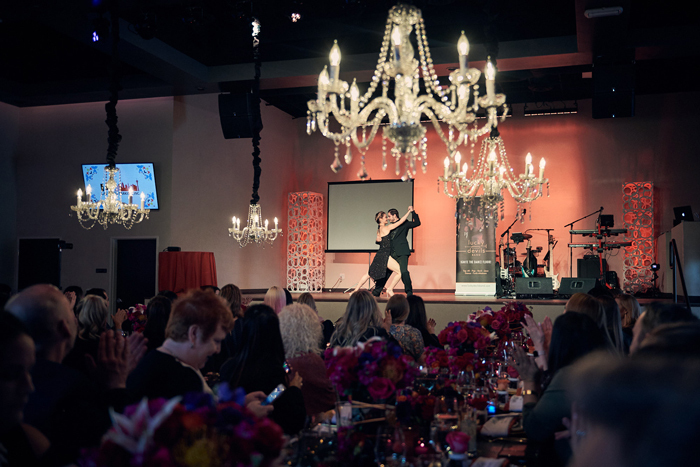 WIPA Las Vegas held our quarterly education event Dream Big, Stay Grounded on July 10, 2018. Guests were welcomed to the cocktail reception at Brooklyn Bowl Las Vegas with WIPA LED marquee letters, courtesy of LED Unplugged. Bubbly champagne and cotton candy were served along with a selection of tray passed hors d’oeuvres. After everyone enjoyed their cocktail, guests were escorted to the LINQ to for the education, and found a seat on the white lounge furniture and cocktail tables provided by Weddings By Dzign. Our speaker Michelle our speaker Michelle Loretta, founder of Sage Weddings Pros, presented "The Power of Profits" and spoke about how profit margins are the most important financial aspect of increasing profitability for the wedding business owner. 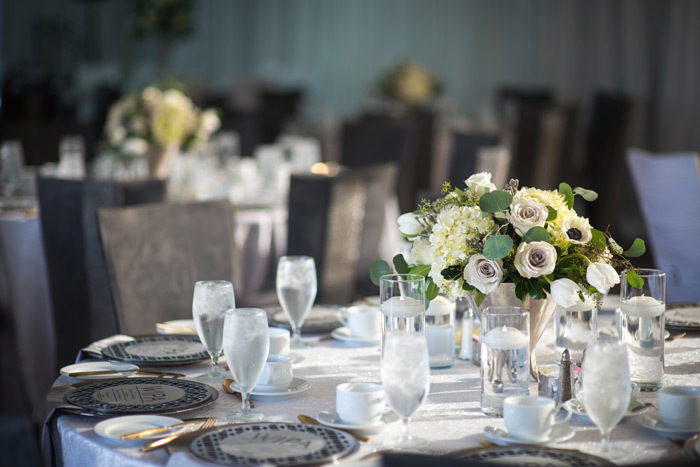 For our meal, guests were led to the Wheelhouse Room at the LINQ which was transformed into a dreamy luncheon in the clouds with white drapery, cloud-like balloon chandeliers, gorgeous ivory floral arrangements and beautiful table décor all provided by Weddings By Dzign. Guests enjoyed tunes from DJ Shai with Ultra Events, took photos in the photobooth provided by Christie’s Photographic Solutions and celebrated WIPA’s 10 year anniversary with CO2 cannons and birthday cake for dessert. The event was beautifully captured by B Freed Photographer and Indiemarch Films. Hot off the press! Las Vegas WIPA member Tara Federico of Scheme Events has released a Las Vegas wedding planning book. WIPA Las Vegas brought in bright colors and Mexican influences for the second quarterly meeting of 2018, a Salsa Soiree. Upon arrival, guests were welcomed with to the brand new event venue Rhythms Event Center with a private valet service provided by Las Vegas Parking. After checking in on the patio, guests imbibed in tray-passed specialty cocktails from the mixologists of Rhythms Event Center, including the Despasito and the Cabeza Picante, and nibbled on passed bites from Border Grill Forum Shops, including green corn tamale cones, ciudad chicken skewers and guacamole tostaditos. While mixing and mingling, the photo booth from Shutterbooth was packed with fun and excitement. The dramatic luncheon scene was set in three long, dark wood kings tables adorned with velvet runners and ornate chairs from RSVP Party Rentals. 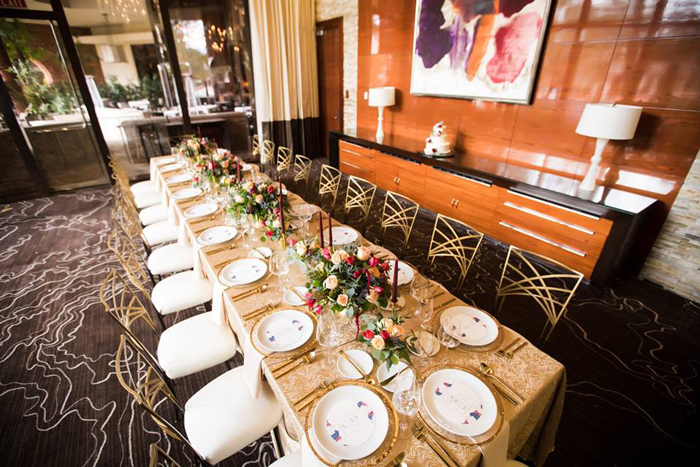 Gold charger plates, specialty china and glassware were provided by Rebel Party Rentals. Place settings were topped with candy favors from Divine Sugar and a unique cloth napkin printed with the event menu, provided by the creative and talented Meldeen Ink. The Mexican-inspired colorful hues of fuchsia, red, and terra cotta were brought in with stunning floral arrangements, accenting gold votives and cute mini cactus created by Naakiti Floral. The look was completed with low hanging crystal chandeliers from LED Unplugged. Guests took their seats and snacked on chips and a salsa trio while enjoying salsa dance performances from Rhythms. Dancing was followed by education from local advertising gurus R&R Partners, who discussed the ins and outs of social media with their presentation titled “Social Publishing Best Practices.” After our education was completed, guests were treated to lunch from Border Grill Forum Shops, including a gourmet taco station, while music was played by the Lucky Devils Band. Closing out the luncheon, guests indulged in delicious Rolled Ice Cream that was rolled to order in fun flavors. Our wonderful Salsa Soiree was documented by Fabio & Adri Photography and New Romantix Videography. 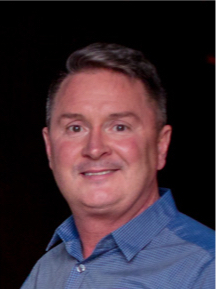 Las Vegas WIPA member By Dzign recently announced its acquisition of fellow WIPA member Epic Event Rentals (formerly operating as the Las Vegas division of Classic Party Rentals). On March 26th, WIPA’s New York Chapter held their first meeting of 2018 at The Glasshouses, one of NYC’s finest event spaces with magnificent views of the iconic skyline. 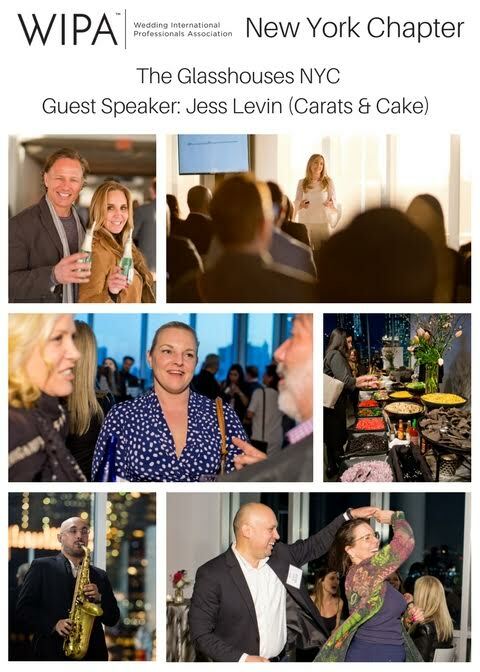 Before opening the doors to the attendees, members took advantage of a private Meet & Greet with Guest Speaker Jess Levin, Founder, and CEO of Carats & Cakes. Once the evening was officially underway, guests took in the gorgeous sunset over the Hudson River and enjoyed the delicious catering of Elegant Affairs and music from a talented harp and vocal duo from Jarrell Entertainment. ProSho Sound provided top-notch audio and visual equipment, and the presentation went flawlessly. Jess Levin focused on “The Business of Diversification” and gave lessons from her four-year journey of building Carats & Cakes. Afterward, guests enjoyed a lively after party for the ages. The brunch mixer brought together the industry’s finest for a morning of networking and learning, and it featured a very special panel of seasoned professionals to share their knowledge.